Tell the meaning of the following: alpha particle, atom, background radiation, beta particle, neutron, nuclear energy, nuclear reactor, particle accelerator, etc. The complete description can be found here. You can find your local council by going to http://www.scouting.org/ and clicking on "local council". The badge's requirements are simple enough that scouts can earn this award in a one-day session or two half-day sessions. We encourage you to participate in this outreach effort. Shamsuzzaha Basunia, from the Lawrence Berkeley National Laboratory, has created a short video on how to create an electroscope. Double click to start or stop the video. We have developed two PowerPoint presentations for your use. The first one is a general presentation and the second presentation discusses famous Nuclear Scientists. Please feel free to use them as you acknowledge us. Requirement 2b: "Choose an element from the periodic table. Construct 3-D models for the atoms of three isotopes of this element, showing neutrons, protons, and electrons. 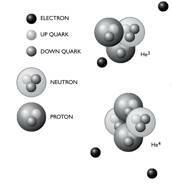 Use the three models to explain the difference between atomic number and mass number and the difference between the quark structure of a neutron and a proton".